Introduction: Assisted body mechanics is used to describe the movement we make each day during normal activities, including lying in bed, sitting, standing, lifting, pulling, pushing and walking. Body mechanics can be both good and bad and can have direct effects on back. Good body mechanics will help remedy and prevent future back problem, while bad body mechanics contribute to back problem and other muscle and bone problems. Nursing is a job that needs a lot of bending our back, arms and legs and pushing, pulling patients, because of which many nurses are at risk for developing physical strains and back injuries or even fractures. Aim: The main aim of the study was to assess the knowledge and practice of internship students regarding assisted body mechanics to reduce the musculoskeletal disorders with a view to develop safety guideline on manual handling technique. Methodology: A descriptive approach was used to collect data from 100 internship nursing students using self administered knowledge questionnaire and practice checklist at Sumandeep Nursing College. Result: The study result shows that 85% of internship students had average knowledge regarding assisted body mechanics, 84 % were practicing good body mechanics technique, 14% had fair practice, and 2% had poor practice of body mechanics. Assisted Body mechanics is used to describe the movement we make each day by getting help of others during normal activities, including lying in bed, sitting, standing, lifting, pulling, pushing and walking. Body mechanics can be both good and bad and can have direct effects on back. Good body mechanics will help remedy and prevent future musculoskeletal disorders, while bad body mechanics contribute to back problem and other muscle and bone problems. Use of proper body mechanics reduced risk of injury to the musculoskeletal system and also facilitates body movement allowing physical mobility without muscle strain and excessive use of muscle energy. Good body mechanics means using the safest and most efficient method to lift and move patient or heavy items. Most people are aware that when they bend or lift something, they should be bending their knees. Attention must also be paid to the position of spine in order to avoid back injury & care must be taken to maintain the neutral spine. A neutral spine means that the three normal curves-at the neck, middle and lower back-are maintained. When viewed from the outside, the back looks straight with a hollow in the low back. Everyday activities can place stress on the spine. Learning how to use good body mechanics will minimize these stresses and decrease the incidence of back and neck injuries. Good body mechanics are not just for the work site but can be used at all times during patient lifting, transfer. To assess the pre-test knowledge and practice of internship students regarding assisted body mechanics. To find out association between pre test level of knowledge and practice of internship students regarding assisted body mechanics with selected demographic variable. To find out co-relation between knowledge and practice of internship students regarding assisted body mechanics. To develop a guideline on assisted body mechanics. H1- There will be significant difference in the pre- test level of knowledge and practice on assisted body mechanics. H2- There will be significant association between pre-test level of knowledge and practice scores with selected socio demographic variables. Research variable – In this study research variable is developing safety guideline on manual handling technique. Target population: In this study target population is internship students. Sample: Samples were internship students from Sumandeep Nursing College. Sample size- 100 internship students. Sampling technique: - Non- probability purposive sampling technique. Data collection instrument: Data collection tool is the instrument i.e. written device that the researcher uses to collect the knowledge data. In this study the structured knowledge questionnaire and practice checklist was used. Development of the tool : The purpose of the study was to assess the knowledge and practice of internship students regarding assisted body mechanics to reduce the musculoskeletal disorders with a view to develop safety guideline on manual handling technique, a structured knowledge questionnaire & practice checklist is found appropriate for collection of data. The tool was developed after review of literature on relevant topics & consultation with subject experts. 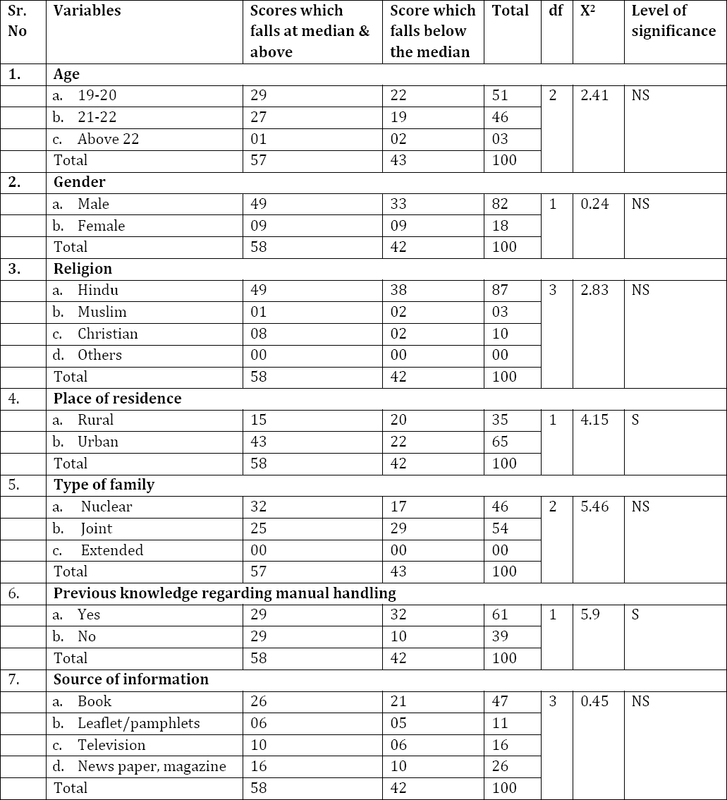 Part I: Demographic data: The characteristics include age, gender, place of residence, type of family, previous knowledge, and source of information. Participants were requested to place a tick mark in the appropriate box provided against each statement. Part –II: Structured knowledge questionnaire: It consist of 30 structured knowledge questionnaires regarding assisted body mechanics. All the statements were multiple choice questions, with three alternative responses. A score value of (1) was allotted to each response. The total knowledge score was 30. The knowledge level was arbitrarily divided into three categories based on self administered knowledge questionnaire and accordingly scores were allotted. Part III: Practice checklist: It consists of 18 practice questionnaires regarding assisted body mechanics. The practice score was arbitrarily divided into three categories based on self administered practice score and accordingly scores were allotted. The study findings revealed that 51% of participants were in age group between 19-20 years, 46% in age group 21-22 and only 3% of participants above 22 years age group, 82% of internship students were females,18% were male, 87% internship students were Hindu, 10% were Christian, only 3% of internship students were Muslim, 37% of students lived in rural area,63% in urban area, 52% of internship students came from joint family, 48% of internship students came from nuclear family, 61% of internship students had previous knowledge regarding assisted body mechanics, 39% didn’t have previous knowledge, 47% of internship students got information from book,12% from leaflet/pamphlets, 15% from television, and 26% from other sources from the news papers, magazine, internet etc. The study results showed that 85% of participants had average knowledge, 11% of participants had poor knowledge, and 4% of participants had poor knowledge regarding assisted body mechanics. 84% of participants had good practice regarding assisted body mechanics, 14% of participants had fair practice and 2% of participants had poor practice. 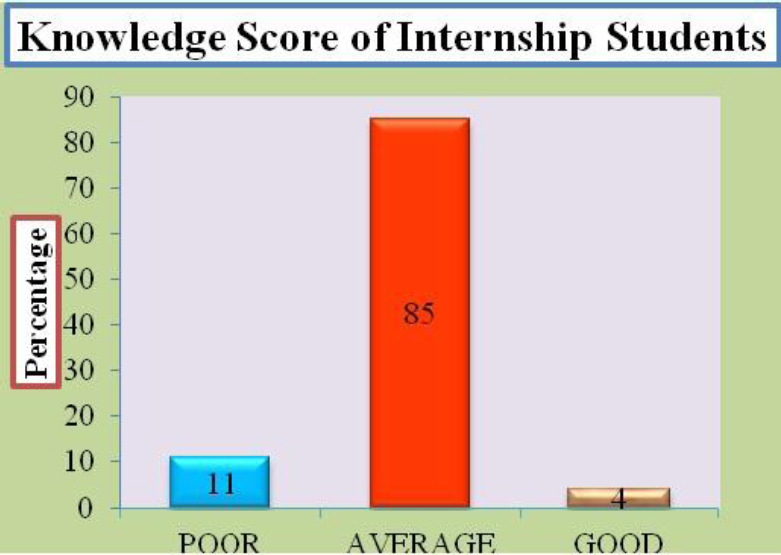 Association of pre test knowledge and practice scores of internship students with their selected socio demographic variables. The [Table 1] shows association between pre-test levels of knowledge score with selected demographic variable with the use of chi square test. In that variable such as age, gender, religion, type of family, source of information found to be not significant because obtained chi square value is less than table value at the 0.05 level of significance hence the research hypothesis is rejected and null hypothesis is accepted. And the variable such as place of residence, previous knowledge found to be significant because obtained chi square value is more than table value at the 0.05 level of significance. Thus the research hypothesis is accepted and null hypothesis is rejected. The [Table 2] shows the association between pre-test levels of practice with selected demographic variable with the use of chi square test. In that variables such as age, religion, place of residence, type of family, source of information found to be not significant because obtained chi square value is less than table value at the 0.05 level of significance hence the research hypothesis is rejected and null hypothesis is accepted. And variable such as gender, and previous knowledge were found to be significant because obtained chi square value is more than table value at the 0.05 level of significance. Thus the research hypothesis is accepted and null hypothesis is rejected. Co-relation between knowledge and practice of internship students regarding assisted body mechanics. The r value is obtained with the use of Spearman Brown's prophecy formula the obtained r value is + 0.984, so there is positive co-relation between knowledge and practice score of internship students regarding assisted body mechanics. The findings of the study based on its objectives are discussed under the following headings: age, gender, religion, place of residence, type of family, previous knowledge, source of information. Following are the observations made. About 51% of participants were in age group 19-20 years, 46% of participants were between 21-22 years age groups, and only 3% participants were above 22. About 82% of participants were females and 18% were male. Regarding religion 87% of participants was Hindu, 10% of participants were Christian and only 3% of participants were Muslim. About 37% of participants lived in rural area and 63% of participants lived in urban area. About 48% of participants belonged to nuclear family and about 52% of participants belonged to joint family. About 61% of participants had previous knowledge regarding assisted body mechanics and about 39% of participants didn’t have previous knowledge regarding assisted body mechanics. About 47% of participants got information from books, 12% from leaflet/pamphlets, 15% television, and 26% got information from magazine, news paper. Association between pre-test level of knowledge score and selected demographic variable was tested with the use of chi square test. In that variable such as age, gender, religion, type of family, source of information were found to be not significant because obtained chi square value is less than table value at the 0.05 level of significance hence the research hypothesis was rejected and null hypothesis was accepted. And the variable such as place of residence, previous knowledge was found to be significant because obtained chi square value is more than table value at the 0.05 level of significance. Thus the research hypothesis is accepted and null hypothesis is rejected. Association between pre-test levels of practice with selected demographic variable was assessed with the use of chi square test. In that variables such as age, religion, place of residence, type of family, source of information were found to be not significant because obtained chi square value is less than table value at the 0.05 level of significance hence the research hypothesis was rejected and null hypothesis was accepted. And variable such as gender, and previous knowledge were found to be significant because obtained chi square value is more than table value at the 0.05 level of significance. Thus the research hypothesis is accepted and null hypothesis was rejected. 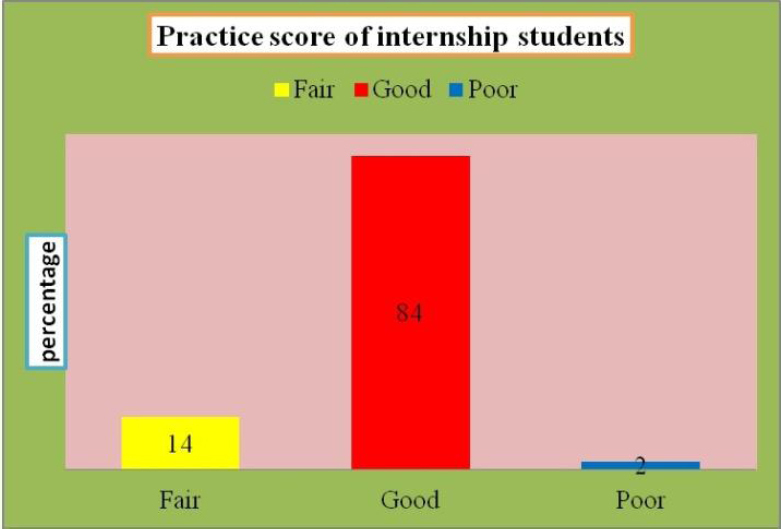 The obtained r value is + 0.984, so there is positive co-relation between knowledge and practice score of internship students regarding assisted body mechanics. The study result shows that almost all students have knowledge regarding assisted body mechanics but did not practice it well because of workload, less time, inadequate transfer equipment. 85% of internship students had average knowledge regarding assisted body mechanics, 84 % were practicing good body mechanics technique, 14% had fair practice, and 2% had poor practicing the body mechanics. The study findings indicated that the majority of the internship students had average knowledge & good practice regarding assisted body mechanics.